Find out what the Pro Tools 11 world will hold for your hardware setup. All plug-ins in the TDM and RTAS formats will not work with Pro Tools 11. Pro Tools 11 will be AAX-only. Pro Tools 11 will be a 64-bit-only application. Pro Tools 10 will be the last version to work with the HD TDM cards. For users who continue to use legacy hardware and software, there will be software updates for three years and hardware support for five years. That should mean that legacy systems using PT10 and legacy hardware such as the TDM-HD cards will continue to work, and Avid will continue to release 'customer service' updates for PT10 to deal with bugs and so on. Legacy HD hardware may find itself in a similar position to third-party offerings from the likes of Lynx and Apogee: not officially supported but still widely used. The situation with these older interfaces might become comparable to that of third-party interfaces from companies like Apogee and Lynx. These were never officially supported by Avid or Digidesign. It has always been up to those third-party companies to enable and support that functionality — and that continues to be the case with new products like the Lynx LT-HD card for their Aurora. So it would appear that these third-party interfaces and the legacy 96 and 192 interfaces will continue to work in a post-Pro Tools 10 world for the foreseeable future, but there can be no guarantees. Moving onto the 002, 003 and Mbox 2 families, the situation is less clear. Although Avid's statements treat them in the same breath as the 96 and 192 'blue' interfaces, my hunch is that post Pro Tools 10, there will be no drivers written for these interfaces, so if you would like to continue using them, you will need to stay with PT10. It is unclear what Avid plan to replace the 003 family with, as its demise leaves a hole in the Avid range. The future of the Control 24, Command 8 and Pro Control is also unclear. Although Pro Control still functions, it has not been officially supported in either Pro Tools 9 or 10, so there is significant speculation that when Pro Tools moves to 64-bit with Pro Tools 11, it will stop working, but who knows? As for the Control 24 and Command 8, there has been no indication as to whether they will continue to work. All we can say for sure is that they definitely won't be supported. I hope this has helped to clear up some of the confusion that has arisen from Avid's announcements about the future of some of their hardware after Pro Tools 10. In summary, Pro Tools 11 and beyond will definitely not support HD TDM cards, TDM or RTAS plug-ins. There is still life left in the 'blue' HD and third-party HD interfaces, but the future looks less bright for native interfaces and older control surfaces. At least Avid have given us plenty of warning so we can plan what we might do when the time comes! 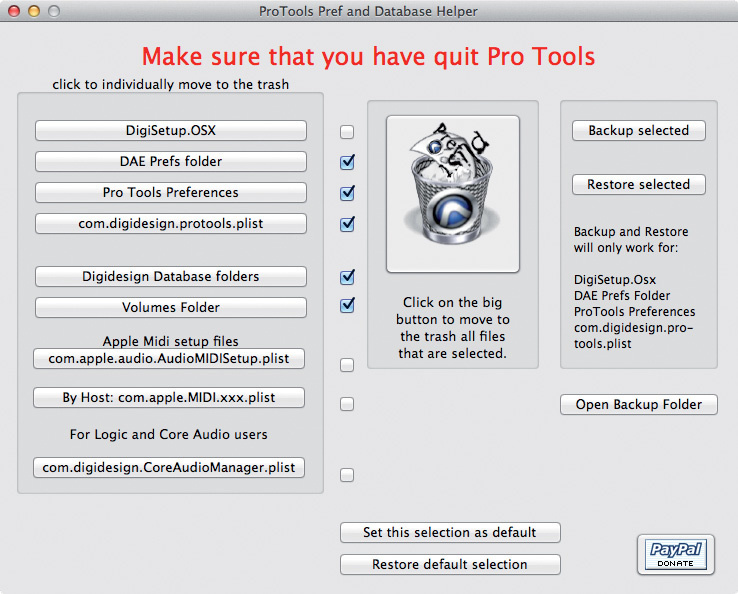 Back up and restore Pro Tools Preferences and DAE Preferences. Back up and restore Pro Tools I/O Settings. 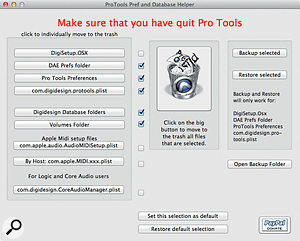 Back up and restore Pro Tools Plug-Ins Settings. Recycle Pro Tools Preferences and DAE Prefs. 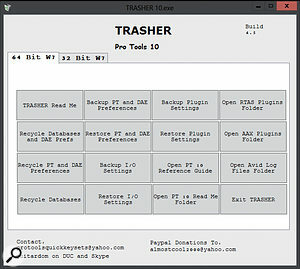 Open RTAS Used and Unused Plug-Ins folders. Open AAX Used and Unused Plug-Ins folders. Open Pro Tools 10 Reference Guide and Documentation. Open Avid Log Files folder. For Macs, Jean-Charles Deshaies has written an application (right) that can do a similar set of tasks — surf to www.jcdeshaies.com and download the version that suits your version of Pro Tools. Once you have downloaded the file and unzipped it, drop the application into your Applications folder and run it. There are tick boxes for each of the options that I have listed above, and Jean has added a feature which allows you to back up your preferences, once you have a working, reliable set of them. This means that when you have to delete your preferences, you can use the Restore feature, so you don't have to work your way through the various Pro Tools Preference panes resetting them from the default settings back to your preferred settings. If, like me, you find this application useful, make sure you click on the PayPal Donate button and give Jean a bit of cash! When troubleshooting, only change one thing at a time, and change it back to confirm. That way you can be sure that the problem goes when you changed it and returns when you restore it. It is the only way to be sure you have fixed the problem. Especially with USB and Firewire interfaces, you should check you have the latest drivers — for third-party interfaces, check the appropriate manufacturer's web site, but for the Avid interfaces check this Avid page, where Avid have been posting regular updates: http://avid.force.com/pkb/articles/en_US/download/en379411. Since Avid unbundled the Pro Tools software from their hardware with Pro Tools 9, it has been possible to use non-Avid hardware with Pro Tools. However, some units work better with Pro Tools than others. If you plan to buy a third-party interface to use with Pro Tools, fear not: there is an independent database based on users' experiences for you to check out at www.pro-tools-expert.com/pro-tools-hardware-checker/.